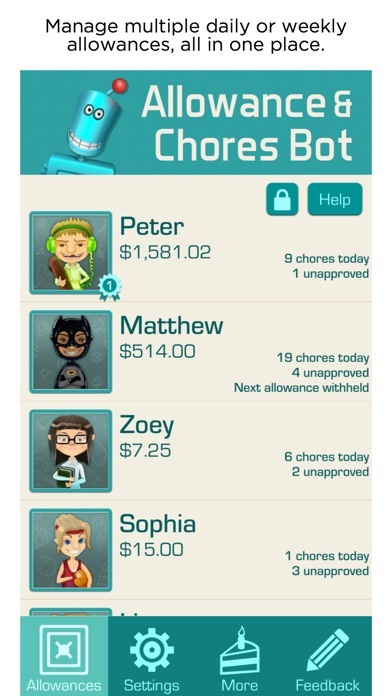 Allowance & Chores Bot makes it easy to keep track of your family's allowances and chores. With Allowance & Chores Bot, children won't lose or misplace paper money and you won't have to keep track of allowances and chores by hand. If your family has more than one device, Allowance & Chores Bot will automatically keep your whole family’s allowances and chores in sync. Unlike other allowance and chore apps, Allowance & Chores Bot does not require any third-party service or special setup to sync all your family’s devices. With Allowance & Chores Bot you can create a daily, weekly, or monthly allowance for each child. Each chore can be a one time chore, or repeated on a daily, weekly, or monthly schedule. 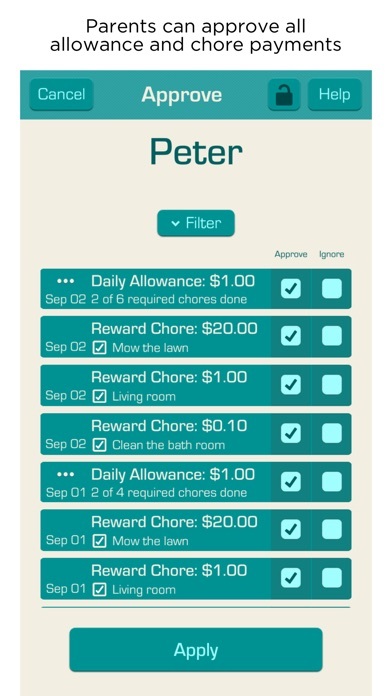 Each chore can be configured so completion is required for the child’s periodic allowance, or the chore can be configured as an extra reward in addition to their allowance. With Allowance & Chores Bot, you can approve or unapprove all allowance and chore payments for up to 30 days. Kids see how much they have saved and when and how much they’ve spent. The Allowance Graph lets your kids watch their allowance savings grow. Kids can see what chores need to be done and check them off when completed. 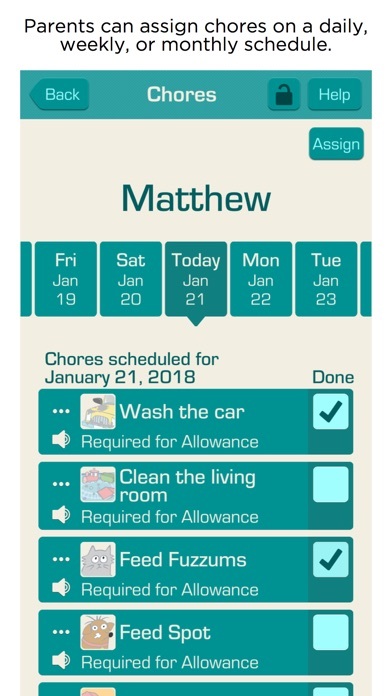 Kids can receive chore reminders without having to open the app. 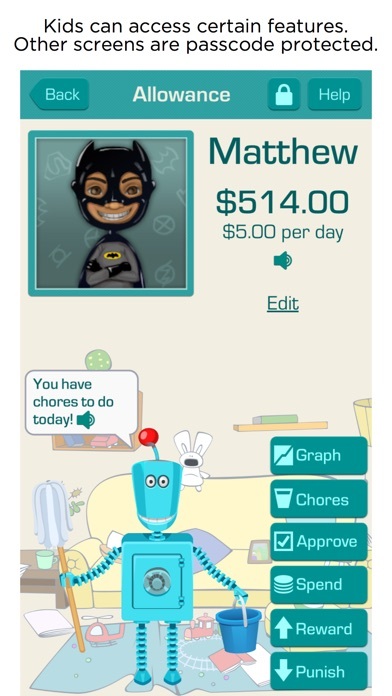 Allowance & Chores Bot gives you everything you need to manage your children’s allowances and chores and teach them about saving money, spending money, and earning money. Features: * Automatic sync between multiple devices - no setup required, just login with the same email and password. * Set up daily, weekly, or monthly allowances. * Choose whether allowances accrue automatically or only after parental approval. * Keep track of how much money children have saved. * Deduct money from a child's account when they spend money. * Easily withhold any number of future allowance payments as punishment. * Supports many international currencies. * Supports several pretend currencies like Points, Smiley Faces, Federation Credits & more. * Assign chores with a daily, weekly, or monthly schedule. * Give rewards for good behavior or good grades. * Allowance Graph lets you see a 30 day history of savings, spending, and chore activity. * Receive notifications when each chore is done, and when approvals are waiting. * Receive reminders when you forget to approve an allowance or chore payment. 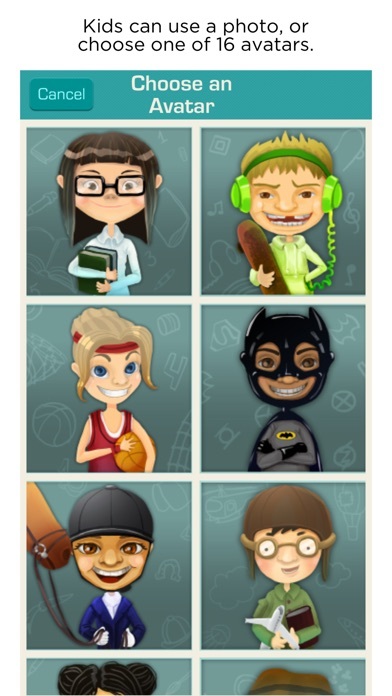 * Photos can be added to each chore to help kids understand what needs to be done. * Pre-readers can have things like chore names, chore descriptions, allowance amounts and savings amounts read to them by the app. * Approve or unapprove allowance and chore payments for up to 30 days. * Optional parental passcode stops kids from making changes without permission. * Optional child passcode allows children to block siblings from having access their account information. * Works on iPhone, iPad, and iPod Touch. Update: After several hours, the app is working again. Thank you! This is THE method we use to keep track of our children’s chores, money, and spending. We use it DAILY. It worked this morning and has crashed in the last couple hours. Can’t get a message to go through on the developer’s website. Please fix! Doesn’t do me any good to track my kids money if the data disappears. Very disappointing. Pretty awesome for my kids to use. I love this app! I use it every day. However, lately it is just not loading. Please fix this so I can continue to use and love the app. Thanks! Hi I’m Jackson and I love this app because I like that there is a way to do chores at my house and get a reward for it I think that you did an awesome job making this app and I really enjoy it I hope you have a great day BYE!!! I’ve been thinking for awhile that needed to look for an app to keep track of my kids allowance without swapping cash back and forth and writing IOU’s. AllowanceBot has been perfect so far. My kids get a visual for what they need to do, and they seem to get things done faster than me nagging at them. It has plenty of options for how often you want chores to repeat and how you want to pay your child. I’m glad that I have less nagging to do now, and the things are actually getting done. It was well worth the couple dollars that I spent on it. I should add, I had a question about approvals and they got back to me within 12 hours. (I wrote them at night.) FYI approvals will come through the next day, even if your child finishes before the end of the day. Great app!